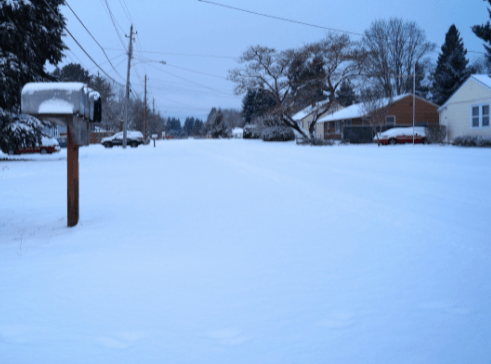 We were hit with a giant pile of fluffy white snow over the weekend. I think it measured close to 10 inches when it was all done. For some of you, wherever you live, this may be the norm. But where we live, this only happens maybe every 5 or 6 years. It practically shuts down the town. The kids just LOVE it! As you can see, the street was coated. It’s sooo pretty, but it seems like the novelty wears off after a day or two, once the kids are all played out. At least it did at our house. Once cabin fever sets in you really have to get creative. So I started Googling fun things you can do in the snow, other than play in it. 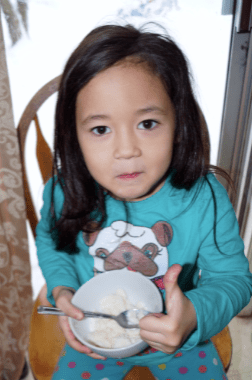 I stumbled on a page that shows how to make snow ice cream. I thought it sounded interesting, so I gave it a shot. And in case you’re wondering. Using this recipe, we didn’t actually eat the snow. There are feral cats, racoons, squirrels, etc. in the neighborhood, so I just couldn’t do it, but this recipe is still fun and delicious. 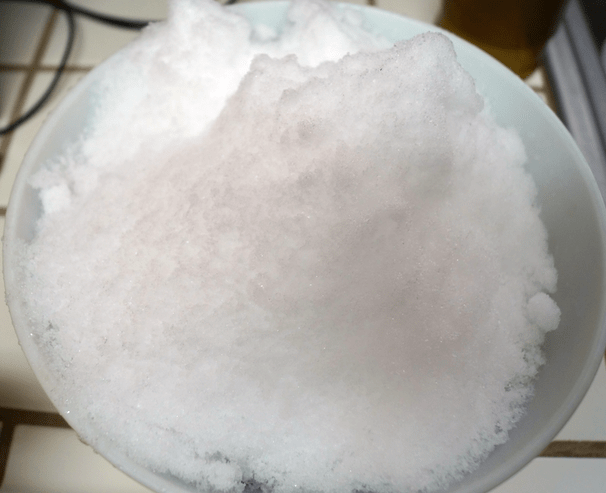 First, fill a BIG bowl with snow or crushed ice and add about 6 tablespoons of salt to the snow or ice. Mix for 5 minutes. Next, grab a ziplock bag and mix the following ingredients in the bag. Let it sit for five to eight minutes. The mixture should freeze into ice cream. Feel the consistency of the ice cream mixture through the bowl. 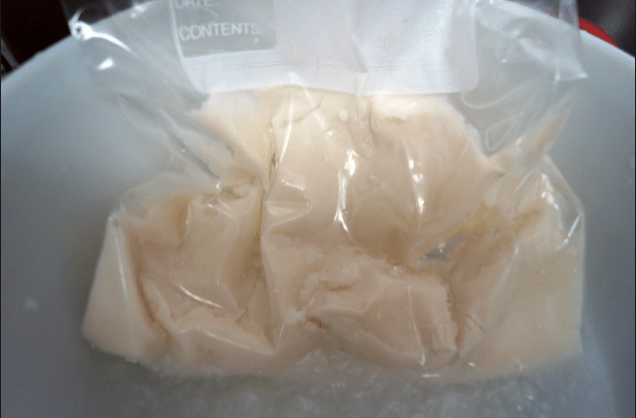 When it feels frozen enough to eat, remove the inner bag and rinse it with water. You can now eat the ice cream straight from the bag or eat from a bowl. It’s a little chunkier than any ice cream I have ever had, but it’s sweet and it tasted good. My daughter liked it. 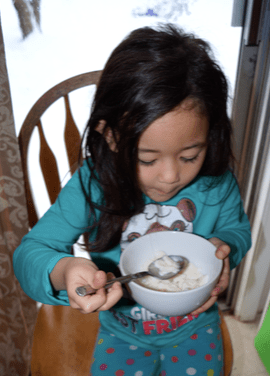 She gave it a thumbs up and emptied the bowl. I say it’s a winner. Disclosure: This post may contain affiliate links. When you click on these links, you are helping to support my blog. Thank you. 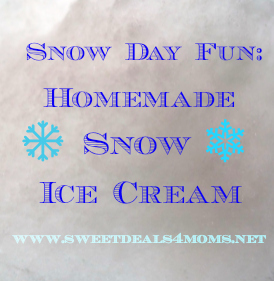 Instant Snow Ice Cream (individual serving): Stir 1 c snow and 1 T sugar together. Add 1/4 c milk and 1 T vanilla. Stir and eat! Enjoy the season. Heather Bayle is a participant in the Amazon Services LLC Associates Program, an affiliate advertising program designed to provide a means for sites to earn advertising fees by advertising and linking to amazon.com.